If you've been even half awake these last few weeks while reading my stuff, you should have gleaned that this Writing This Ship "series" has been all about getting some semblance of caught-up going on around here. So far I've been sticking to the plan of posting 3-4 of these per week with the ultimate goal of somewhere between 15-20 that take us eventually back to late Spring/early Summer timeframe when the Craft Brewers Conference/World Beer Cup and Philly Beer Week completely consumed and tsunami'ed me. After sharing with you a couple days ago a bit of an update and an event announcement related to my book (translation: come out and see me at Open Book in Elkins Park next Thursday! ), it got me to thinking about some other published material of mine that you might find interesting. The kind of material that is reaching for the mass/newbie market. But, that's important (before you discount it) because there's still a great big wide world of untapped and recently tapped consumers thirsting for more information about our favorite beverage. As my aim has forever been, this fits perfectly in my quest to continue spreading as much useful information as possible to help as many as possible feel comfortable learning about the sometimes simple, more often complex world of beer. Case in point, for the past year on a quarterly basis, I've had an article published in the print magazine, County Lines. Headquartered out of West Chester, Pa., the magazine is a substantially color-filled stack of pages focused on the diverse Chester County. My beer articles have covered How To Taste Beer (Jan. 2016), Celebrate With Beer (Apr. 2016), and Beer Is Hot (Jul. 2016). The Oct. 2016 article yet to have a title has been submitted and covers the award-winning breweries of the region. It will be timely as it releases on Oct. 1 with the Great American Beer Festival awards being doled out on Oct. 8. 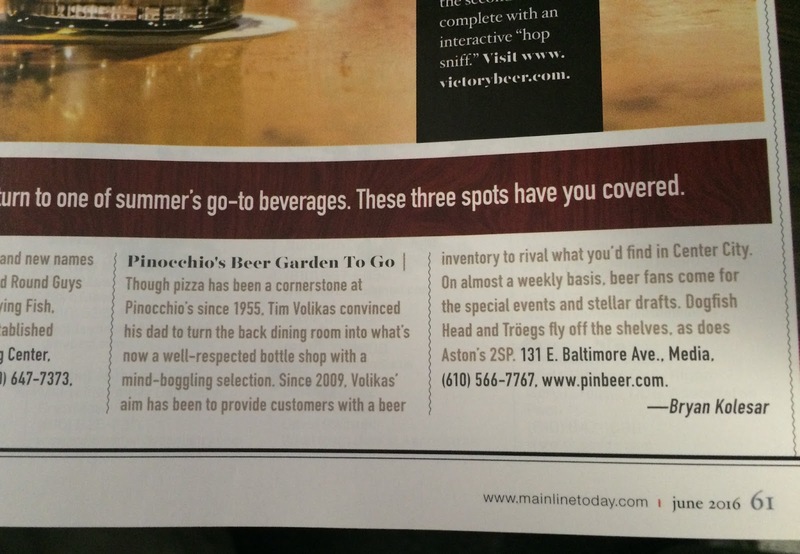 Over in the pages of Main Line Today, the June issue had a small sidebar from me covering three places along (loosely speaking) the Main Line with great bottle shops for backyard and beach beer to go. 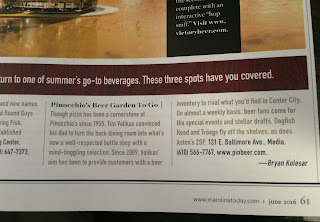 The Beer Shoppe in Ardmore, The Beer Store in Malvern, and Pinocchio's in Media each got props for doing what they do so well.